Move Over Pizza Rat, There’s a New King of NYC — Introducing Henny Rat! Joining the likes of infamous rodent celebrities found in the streets of New York (here’s looking at you Pizza Rat, Flood Rat and Millennial Avocado Squirrel), we present to you...Henny Rat! A picture taken of a rat seemingly "passed out" on a sidewalk while holding on to an empty Hennessy liquor bottle was posted on Twitter by Chris Williamson under the handle @CWilliamson44. Williamson said he took the photo on Monroe Street and Ralph Avenue in Bed-Stuy around 11 a.m. Valentine’s Day. Could it be that the rodent was trying to drink away a heartbreak during the love-filled holiday? One can’t be sure — and it's unknown if "Henny" is OK — but with thousands of likes and retweets, the twitterverse commented on the peculiar scene. “He/she was drinking away the pain from the Knicks’ 18th straight loss,” @CWilliamson44 went on to comment once again. 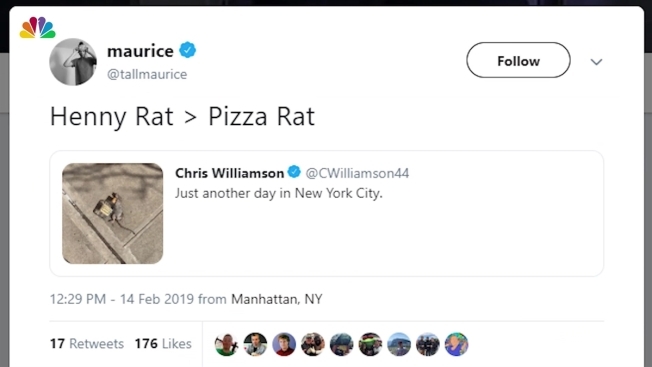 “Pizza Rat fell on hard time,” @PardonMyRicci commented. Meanwhile @stephenkeenan14 simply tweeted “Lightweight” along with a laughing emoji. Other users made references to the rodent movie character Ratatouille, while another referenced Stuart Little. “Yo I use to love Stuart Little, it’s a shame how much alcohol can change someone,” @Brycekauf tweeted.